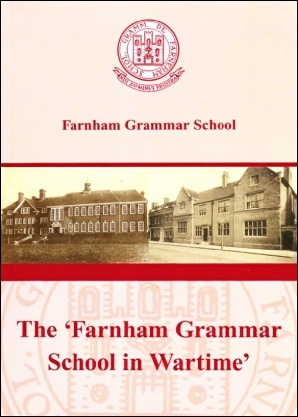 This page is used to promote publications about Farnham Grammar School, the College, or Farnham generally. If we have overlooked adding details of any publication of interest, please let us know. Cyril Trust has also published The Teachers: Part One. This booklet includes profiles of some of the teachers at the school, most of them from the 1920 to 1960 era. David’s first novel “Stumbling on Mountains” was published in October 2015. Mike Partridge is clumsy, careless and lazy and, despite being a husband and a father, he has no real feelings for anyone except himself. He cannot even find it in himself to love his beautiful adopted daughter Katie. Through a moment's stupidity he loses his job and his family, and suddenly his life is in ruins. This heart-warming and inspiring story will be enjoyed by anyone who has a love for the great outdoors and its power to change lives for the good. 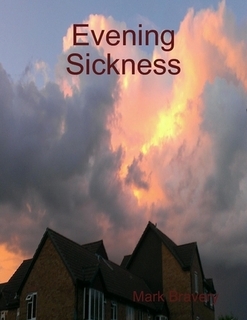 All of the profits from the sale of this book will be donated to the Sussex Snowdrop Trust, providing help for families with children suffering life-threatening or life-limiting illness. 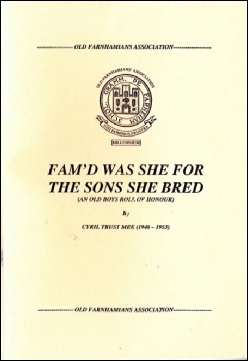 Cyril Trust, historian of the Old Farnhamians’, has published Fam’d Was She For The Sons She Bred, an Old Boys Roll of Honour. The inspiration for this book came from an article in the Surrey & Hants News, when a certain Old Boy from Farnham Grammar School wrote that in his opinion the school had not produced anyone of note in its long history. This was questioned by Cyril Trust and Leonard Evans, for many years Chemistry master at the school. Here you will find a set of profiles of the 16 former pupils who I felt had been the most famous in the history of the school. These included Cyril Garbutt who became Archbishop of York, Owen Pennefather Lloyd who won the Victoria Cross and Ronald Ridout who holds the Guinness Book of Records for writing the most text books in history. Cyril Trust and Jenny Harvey, part-time archivist of Guildford College Corporation, have published The Farnham Grammar School in Wartime. Published in the centenary year of the start of the First World War, this booklet surveys the effects of two world wars on the School, its staff and its pupils. The principal sources used are the pages of the Farnhamian, along with letters and reports which offer a variety of viewpoints. The contents cover: the oldest account of an Old Boy in Wartime, the unveiling of the Roll of Honour in 1929, the names on the Roll of Honour, the first Old Boy to be killed in the First World War, Salute to the Brave: the Fallen of Farnham Grammar School during the First World War, Letters from the front line, Armistice Day 1919, on the Home Front in the First World War. The names on the Memorial Tablet 1939-1945, Roll of Honour 1939-1945, Remembering Arthur Job, Salute to the Brave: the Fallen of Farnham Grammar School during the Second World War, the air raid shelter and other extracts from the Farnhamian, some stories of Old Boys who served in the war, on the Home Front in the Second World War, Remembrance Day 1946, Field Marshal Montgomery at Farnham Grammar School. 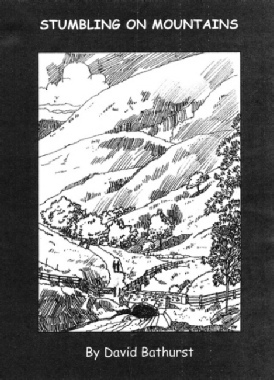 86 pages, four illustrations in black and white, A5 format, softback, and with full-colour cover. 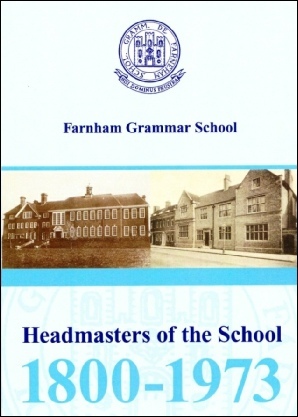 Cyril Trust and Jenny Harvey, part-time archivist of Guildford College Corporation, have published The Headmasters of Farnham Grammar School 1800-1973. 88 pages, 17 illustrations in black and white, A5 format, softback, and with full-colour cover. 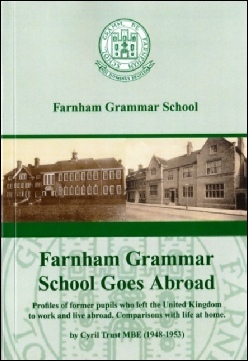 Cyril Trust, historian of the Old Farnhamians’, has published Farnham Grammar School Goes Abroad, which includes profiles of former pupils who left the United Kingdom to work and live abroad. Cyril’s inspiration for this book came from his study of memorabilia from the Grammar School which made it clear that many of the pupils travelled abroad and many now live, or lived, overseas. There are several reasons for this, and this book gives the details of many of those concerned and their reasons for leaving the United Kingdom. Some of the reasons for moving abroad include being posted overseas as a member of the armed services, apprenticeships at the Royal Aircraft Establishment at Farrnborough (or British Aerospace at Weybridge) leading to careers in the aircraft industries in America, Canada and Australia.